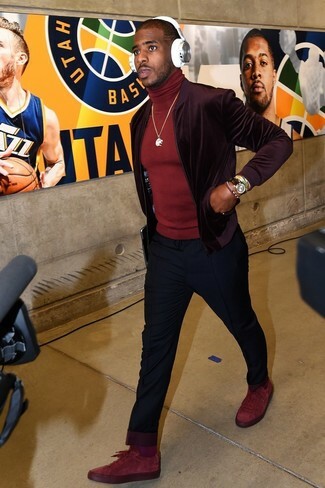 If you're searching for a casual yet on-trend getup, marry a burgundy turtleneck with navy chinos. Both items are totally comfortable and will look great together. And if you want to instantly up the style ante of your look with one piece, add black leather brogues to the equation. 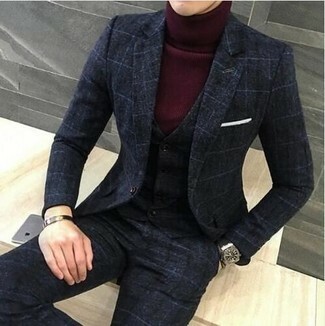 This combination of a N.Peal ribbed roll neck jumper from farfetch.com and navy vertical striped dress pants is very easy to put together in next to no time, helping you look awesome and ready for anything without spending too much time going through your closet. For a smart casual getup, pair a N.Peal ribbed roll neck jumper from farfetch.com with grey check dress pants — these items fit beautifully together. When it comes to footwear, this look pairs nicely with black leather monks. 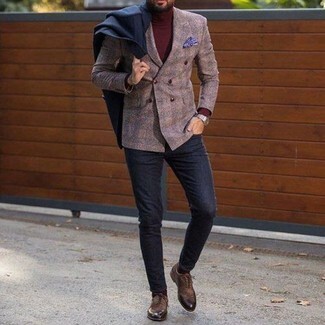 If you're on the lookout for a casual yet stylish outfit, consider teaming a burgundy turtleneck with navy chinos. Both garments are totally comfortable and will look great together. For something more on the daring side to finish off this getup, rock a pair of burgundy low top sneakers. 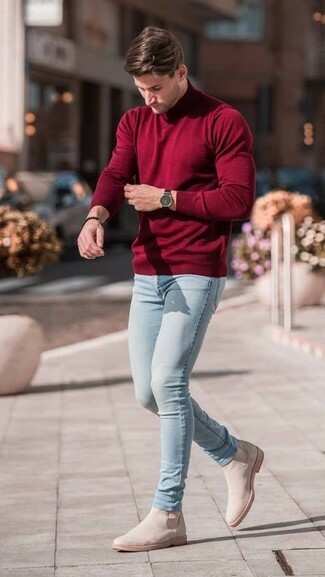 If you're searching for a casual yet stylish ensemble, pair a burgundy turtleneck with black chinos. Both garments are totally comfortable and will look great paired together. For something more on the daring side to finish off this ensemble, choose a pair of white canvas low top sneakers. If you're on the hunt for a casual yet on-trend look, consider wearing a N.Peal ribbed roll neck jumper and light blue skinny jeans. Both garments are totally comfortable and will look great paired together. Bump up the cool of your getup by finishing off with beige suede chelsea boots. 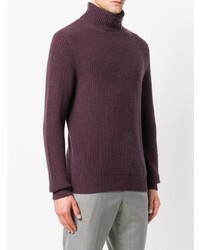 Choose a N.Peal ribbed roll neck jumper from farfetch.com and a charcoal check three piece suit for incredibly stylish attire. 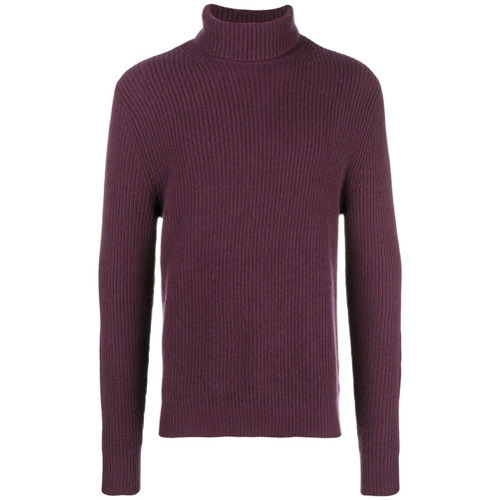 If you're on a mission for a casual yet sharp ensemble, wear a N.Peal ribbed roll neck jumper and navy skinny jeans. Both pieces are totally comfortable and will look great paired together. Perk up your getup with dark brown leather chelsea boots. 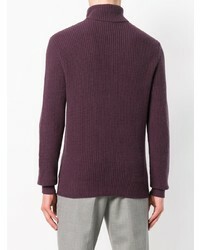 If you're after a casual yet dapper look, try pairing a N.Peal ribbed roll neck jumper with black wool chinos. Both garments are totally comfortable and will look great paired together. 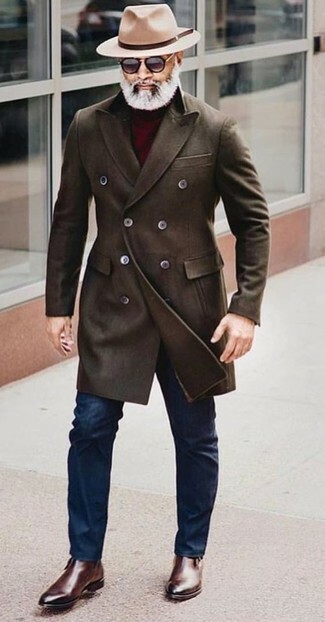 Rocking a pair of dark brown leather oxford shoes is an easy way to add extra flair to your getup.